Mix the mirin, sake, soy sauce, water and brown sugar and bring to a boil, reduce by half and let it cool down. Cut the chicken into small equal pieces and add into the liquid. Let it marinate for 3 hours. Put the skewer together by starting with chicken, piece of spring onion, chicken, spring onion and finish with chicken. 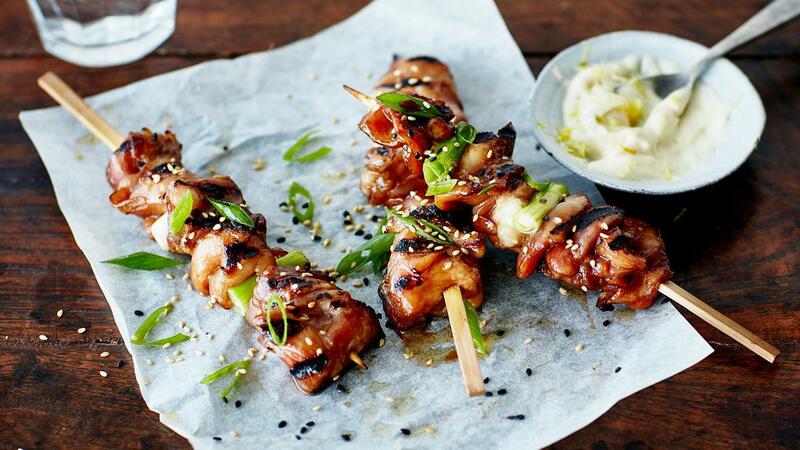 Grill the chicken skewers and finish with spring onion, and some roasted white and black sesame seeds. Serve with the yuzu mayonnaise.